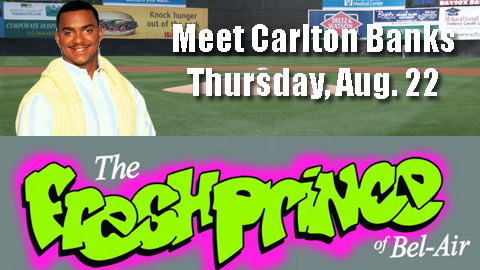 Fans of the hit NBC show "Fresh Prince of Bel Air" won't want to miss this special event when Alfonso Ribeiro, "Carlton Banks" comes to the Baysox on Thursday, August 22 @ 7:05 for Fresh Prince of Bel air Night at the Baysox! Alfonso will meet fans, take pictures and sign autographs during the game and as a special treat, will also perform the National Anthem before the game! Get your tickets and make plans to meet Alfonso, star of Fresh Prince of Bel Air and host of the new ABC Family show SpellMageddon! Fans will have the opportunity to get one (1) autograph OR one (1) photograph with Mr. Ribeiro only. For those seeking an autograph, you will need to bring your own item to be autographed and have it open and ready while in line waiting to meet him. For those seeking a photograph with Mr. Ribeiro, please have your camera on and ready as you approach your opportunity in line. Due to the overwhelming response expected for this event, Mr. Ribeiro will get to as many fans as possible, but may not get to everyone. Purchasing a ticket to this event does not guarantee an opportunity to meet Mr. Ribeiro in person. Don't be late to the event as Mr. Ribeiro will be performing the National Anthem prior to the game. We thank you for your understanding and cooperation with the policies in place for this event."